Thisstory was updated at 1:04 a.m. EST. NASAdelayed the planned February launch of the shuttle Discovery for the fourthtime late Friday, leaving the space station-bound construction flight in limboas debate continues over whether the spacecraft can fly with potentially faultyfuel valves. Theannouncement came after a day-long meeting of senior NASA managers to discusswhether the space shuttle was ready for a planned Feb. 27 launch toward theInternational Space Station. ?We werereally, really close to having the entire team at a point to where we couldaccept to go fly,? said space shuttle program manager John Shannon after the 13-hourmeeting at NASA?s Kennedy Space Center in Cape Canaveral, Fla. ?There was justa sense of unease that we did not quite have the rigor that we typically expectfrom a question like this.? Discovery?smission hasalready been delayed several times so shuttle engineers could run a seriesof tests on the fuel control valve concerns. 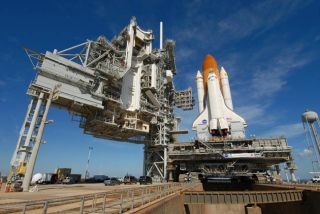 The shuttle was slated to launchon Feb. 12, with subsequent delays pushing it back three more times to giveengineers more time to complete valve tests. On Friday, shuttle managers wereunable to settle on an acceptable rationale to fly the mission until a morecomplete analysis on the valves is available. ?When we gofly, we want everybody on the team to be right behind us and ready to go,?Shannon said, adding that some valve test data came late in the week, andothers contained errors. ?We probably could have gotten there tonight, but wewould have left some unease in some people?s minds.? Shannonsaid mission managers hope to reconvene by next Wednesday to take stock of newprogress on the fuel valve assessment and again discuss potential launch datesfor Discoveryand its STS-119 crew. NASA spaceshuttles each have three fuel control valves, one for each main engine. Thevalves function much like pop-up lawn sprinklers to route gaseous hydrogenthrough a set of plumbing lines that feed into the liquid hydrogen reservoir ofa shuttle?s attached external tank and maintain the proper pressure duringflight. DuringNASA?s most recent shuttle launch last November, one of the Endeavour orbiter?sfuel control valves developed a crack, with a small chip breaking off. WhileEndeavour successfully reached orbit without incident, mission managers want tobe sure a similar event during Discovery?s launch would not puncture the shuttle'svital plumbing lines and cause catastrophic damage. Shuttleengineers later found that stresses and high-cycle fatigue from harmonicoscillations can lead to tiny cracks in the valves, allowing bits to break offduring flight. After the November shuttle launch, NASA replaced the fuel valvesaboard Discovery with ones known to be in good shape. Shannonsaid shuttle engineers are tackling the issue on two fronts. They are workingto decide if the valves currently aboard Discovery can fly as they are, as wellas studying the potential consequences should the valves break during flight. NASA isalso studying whether the valves will have to be redesigned in the near-futurebefore the agency retires its three-shuttle fleet in 2010. NASA is planning tofly nine more shuttle missions to complete space station construction and overhaulthe Hubble Space Telescope. ?It is theprogram?s ultimate goal to redesign that valve so we can put that problembehind us,? Shannon said. NASA hasuntil about March 12 to launch Discovery toward the space station and completeits 14-day mission before the arrival of a Russian Soyuz spacecraft ferrying a newcrew to the orbiting laboratory. If the shuttle doesn?t lift off by then, NASAwould stand down until after the space station crew change, with the nextlaunch opportunity arising around April 7, mission managers said. Commandedby veteran spaceflyer Lee Archambault, Discovery?s seven-astronaut crew willdeliver the last section of the space station?s backbone-like main truss andthe final set of U.S.-built solar arrays. Four spacewalks are planned for themission, which also includes a one-astronaut swap for the space station?sExpedition 18 crew. Japaneseastronaut Koichi Wakata of the Japan Aerospace Exploration Agency will launchto the space station aboard the Discovery to replace NASAastronaut Sandra Magnus as an Expedition 18 flight engineer. Wakata, aveteran spaceflyer, is Japan?s first long-duration astronaut. Magnus haslived aboard the space station since last November and will return to Earthaboard Discovery after months of living and working in orbit. Wakata is due toreturn home aboard another NASA shuttle later this year. IfDiscovery launches by March 12, its delays should not have substantialrepercussions for the up to five other shuttle flights NASA has on its 2009schedule. Launching in April, however, would likely cause a ripple of delaysfor subsequent flights, mission managers said. ?The restof the manifest kind of slips consecutively as that happens,? said BillGerstenmaier, NASA?s space operations chief. Shuttleofficials also said Friday that theunexpected collision between U.S. and Russian communication satellites lastweek has not hindered plans to launch Discovery, despite causing two largeclouds of shrapnel that are now circling the Earth, mission managers said. The Feb. 10collision occurred over Siberia when a U.S. Iridium communications satelliteand a defunct Russian military satellite crashed into each other 490 miles (790km) above Earth. The U.S.Defense Department?s Space Surveillance Network and NASA have been trackingthe resulting debris, but have said it poses a relatively small increase inrisk to both the space shuttle and the International Space Station, which iscurrently home to two American astronauts and a Russian cosmonaut. The spacestation orbits Earth at an altitude of about 220 miles (354 km). Gerstenmaiersaid Friday that the new debris increased the risk to the space station andvisiting space shuttles by about 6 percent. NASA debrisexperts are studying the shrapnel clouds to determine what risk they may poseto shuttle astronauts bound for the Hubble Space Telescope later this year.That spaceflight is currently slated to launch in late May to pay the lastservice call on the iconic space telescope, which orbits the Earth at some 372miles (600 km). ?Thatdidn?t look so good, when they looked at that,? Gerstenmaier said. But thefinal risk assessment will likely take a few more weeks as scientists get moreinformation on the extent of debris within the two shrapnel clouds, Gerstenmaiersaid. The satellite collision?s impact on NASA?s plans for the Hubble shuttleflight should be clearer by mid-March, he added.